British luxury car manufacturer Jaguar Land Rover announced 450 job losses on Wednesday due to a "severe" reduction in demand for new cars. LONDON (Reuters) -- British luxury car manufacturer Jaguar Land Rover announced 450 job losses on Wednesday due to a "severe" reduction in demand for new cars. The Coventry, West Midlands-based company, part of India's Tata Motors said it was proposing to shed about 300 management roles and a further 150 salaried agency staff. Managers at the company will not receive any bonuses in 2009 and any management pay increases have been deferred to Oct. 1 2009 at the earliest, the group said. Jaguar Land Rover Chief Executive David Smith said: "It is only right and proper that our response to the unavoidable impact of the credit crunch and a severe reduction in demand includes actions across all grades and functions in the company. We don't expect sales conditions to return to normal levels for some time." Tata bought Jaguar and Land Rover from Ford in June last year for about $2.3 billion. 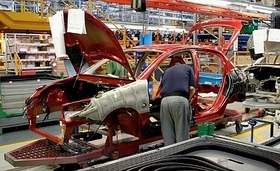 Jaguar has four plants in the UK while Land Rover has a plant at Solihull in the West Midlands.